The sun was keeping us warm on a beautiful Sunday (last weekend) as we had the pleasure of enjoying a line up of some amazing local sf bands like Tartufi, Odawas, and Geographer at the 2nd Annual Rock Make Music & Art Festival. Tons of local vendors lined Treat Street offering an eclectic variety of arts & crafts, clothes, jewelry, and vintage finds – I scored a pair of beautiful vintage button earrings! 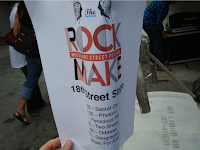 Little did people know, there would be even more to the festival than just awesome live music and great merch. That’s right! FREE VIV STICKERS! 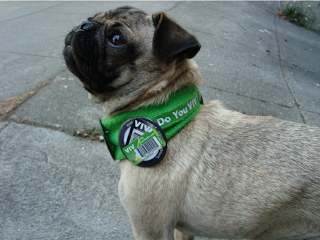 I brought along my trusty friend and Viv spokesmodel, Lola (above). I was a little jealous of all the attention she was getting – but was definitely excited about how many people were stoked on Viv! We had a lot of fun, met some great people, and got them all Viving! Look for Viv and Lola at other upcoming events! She’s not shy – you can ask for an autograph.